North Carolina triple murderer Craig Stephen Hicks' first wife says he was obsessed with the 1993 Joel Schumacher film Falling Down, starring Michael Douglas as William "D-Fens" Foster, an angry white man on a maniacal sociopathic rampage. The dark white-world wish-fulfillment fantasy in this popular Hollywood film was designed to tap a generalized social antagonism toward "reverse discrimination" and multiculturalism in the 1990s. The film valorizes the frustrations and anger of the isolated "liberal" individualist, an engineer who's been put out of work in the nuclear defence industry, has marital difficulties and shows little patience with the traffic problems which crop up on LA freeways (of all places! ); the film charts this new-age American hero's erratic, credibility-stretching reassertion of white privilege in a series of increasingly destructive stupid-macho acts, beginning with a more or less random assault upon a Korean shopowner, who has the audacity to charge him all of 85 cents for a can of Coca-Cola, while looking and acting extremely... "Korean". "It's seemingly meant as a sort of dark comedy about the petty annoyances of life, and how they can accumulate and become so maddening that over-the-top cathartic violence seems like the only satisfying option. But Douglas' violent reaction to his surroundings, and the way the film treats virtually everyone around him as worthless, and presents his violence as the comedic payoff, turns it into a tone-deaf, self-pitying lament about the terrible persecution facing the oppressed majority in an era of political correctness and increasing multiculturalism. In its ugly, skewed world, almost everyone but this madman is dumb, incompetent, and offensive, and his only possible solution is to wipe a few of these losers off the face of the earth, then die. It's a profoundly hateful film disguised alternately (and erratically) as either tragedy or humor." Did Craig Hicks see himself as the irascible, wronged and legitimately aggrieved American lone-wolf hero played by the Hollywood actor? 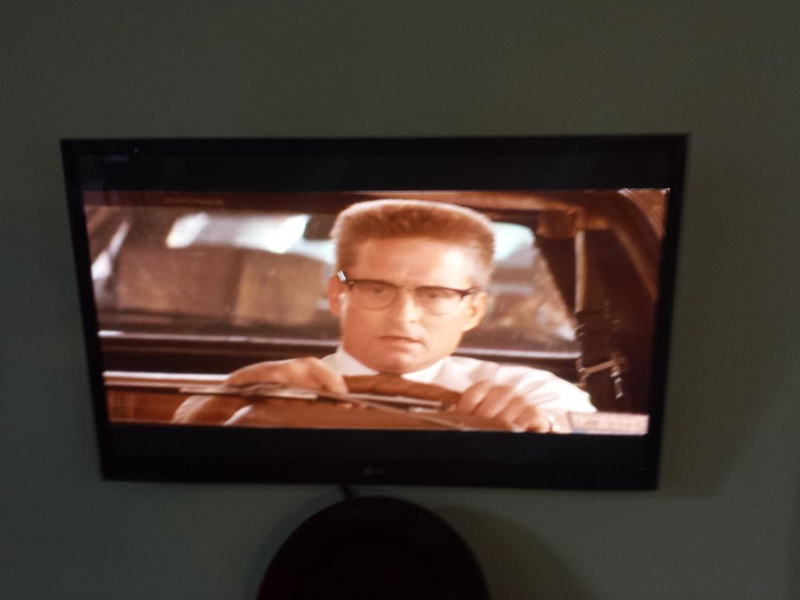 "Hicks' ex-wife, Cynthia Hurley, said that before they divorced about 17 years ago, his favorite movie was 'Falling Down,' the 1993 Michael Douglas film about a divorced unemployed engineer who goes on a shooting rampage. "'That always freaked me out," Hurley said. 'He watched it incessantly. He thought it was hilarious. He had no compassion at all,' she said." It is clear from his Facebook page that Hicks, viewing the world from within his private fantasy bubble, considered religion a problem in general as well as a personal nemesis. The page includes no mention of parking issues. It does however contain strong hints as to Hicks' private conception of a remedy for the larger issues concerning him. "Frequent posts about atheism and featuring anti-religion views appeared on a Facebook page in Hicks’ name, with a recent post reading: 'People say nothing can solve the Middle East problem, not mediation, not arms, not financial aid. I say there is something. Atheism.' One post also featured a photograph of a revolver on a scale bearing the caption: 'Yes, that is 1 pound 5.1 ounces for my loaded 38 revolver, its holster, and five extra rounds in a speedloader.' According to the page, Hicks studied as a paralegal at Durham Technical Community College in Durham, North Carolina, and was a supporter of 'Atheists for Equality.'" Joel Schumacher, who directed Falling Down, had been regularly aiming his films at specific target audiences; most commonly, in his string of box-office successes immediately preceding Falling Down (Flatliners, The Lost Boys, St Elmo's Fire), at "generational" audiences composed largely of males in their late teens and twenties. He called "working with adults" a defining aspect of his moving on to do Falling Down. "I felt that there was a critical mass building in culture of anger and rage," he told interviewer Chris Robergé of Tech after the film's 1993 release. "In the last 12 years it was swept under the carpet while all of the problems kept getting worse and worse. Unlike in the 60s when most creative people were expressing their feelings, outside of African-American filmmakers and rappers and street art, I didn't see much going on. I wanted to be in people's faces about what was going on. In some ways I think that it's worse now than when we started making the film. Local news seems to be filled with these types of crimes. This sort of crime is on the rise in the country. Just last week there were two in D.C. and one in Memphis. I tried to put a face and a soul to these six o'clock news stories. This is the guy whose neighbors you see saying, `I don't understand. He was very nice.' 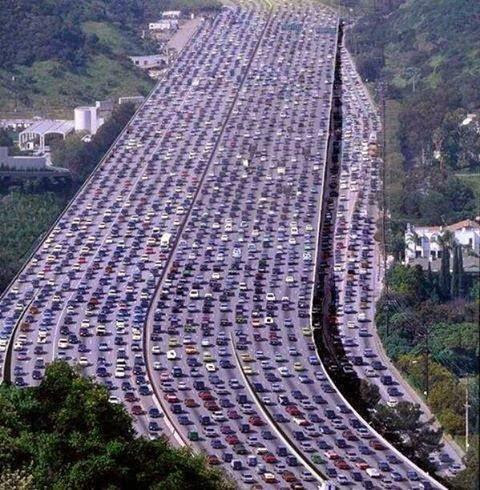 "
Even very nice guys have bad traffic days, right? But it seems the real-life individual upon whom Schumacher based the Michael Douglas / "D-Fens" character was viewed in a somewhat different light by those who had actually known him: his mother and ex-wife, for example, suggested he had been not quite so "nice", perhaps, as the director would have it. "Both of them," reported Tech, "thought that he was a somewhat frightening man with a propensity towards violence even before he begins his tragic trek across Los Angeles. Still, Schumacher insists, "'I thought that he has an Everyman quality. I didn't want him to be a lunatic.'" Everyman good. Many butts in seats. 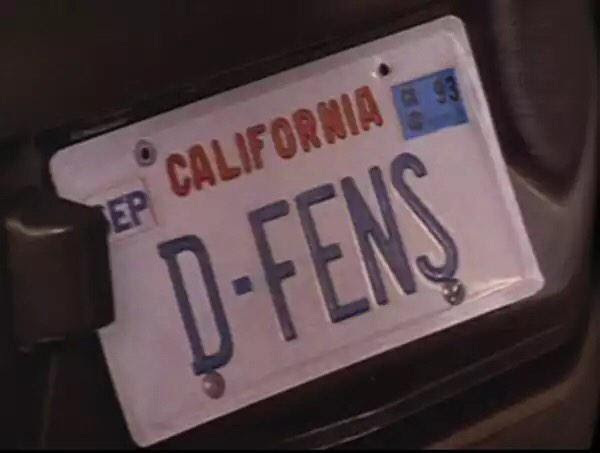 A similar confusion of fact and intent haunts the film, which attempts repeatedly to elicit a sort of sick sympathy for this character -- whose bad day starts, not with an exacerbated parking dispute, yet parked and exacerbated all the same, in a freeway traffic jam. Honk! Then later, logically enough... apocalyptic American Terrorist mayhem. When a pissed off nuclear engineer blows his wig, common sense and civilization watch out! 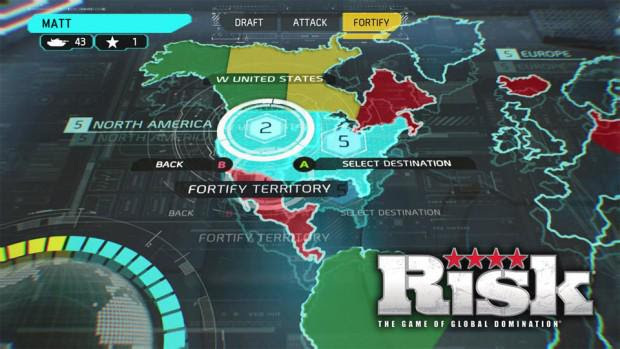 It's like in the game of Risk: the best defense is a vigilant, aggressive offense. 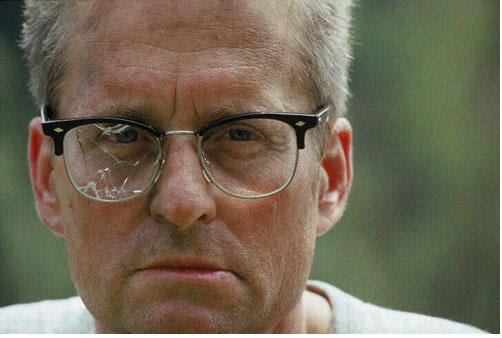 Falling Down is tugged to and fro by more jagged reversals of sympathetic identification than perhaps any other film in cinematic history. The cause of the movie's deep confusion? Simple enough, to hear its creator tell it: this is Hollywood, not reality. "First and foremost, I have to make some sort of entertainment. I don't like movies that are soapboxes. I felt that the movie was a good story with a western type formula... I feel that [the enraged protagonist] acts out a fantasy behavior. I think that audiences will be hard pressed not to identify with him. I think that people are conflicted. That's the purpose of the film. I think that it would be nice to do this, but we can't... I think we are a violent culture and there's a thin line between what's considered acceptable violence and what's considered unacceptable violence." Falling Down tries to have it both ways, wobbles back and forth across that thin line, now proposing itself as a serious drama about the plight of the ordinary decent hardworking average Joe turned righteous avenger, now as broad comedy portraying, with tongue no more than half in cheek, a cartoon psychokiller taking out his moment-to-moment rages on a series of predictable racial stereotypes (which is evidently the way Craig Hicks also envisions the game, though of course Craig's not Michael Douglas, he's a real player, and he's all too dead serious). To employ two of its old reliable clichés, Hollywood has been having its cake and eating it too while getting away with murder for a good while now. 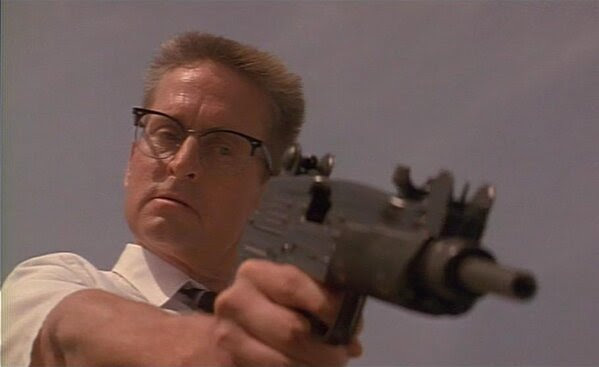 The Douglas character in Falling Down doesn't waste any time doing depth analytics on the sociology of the neighbourhoods he invades. 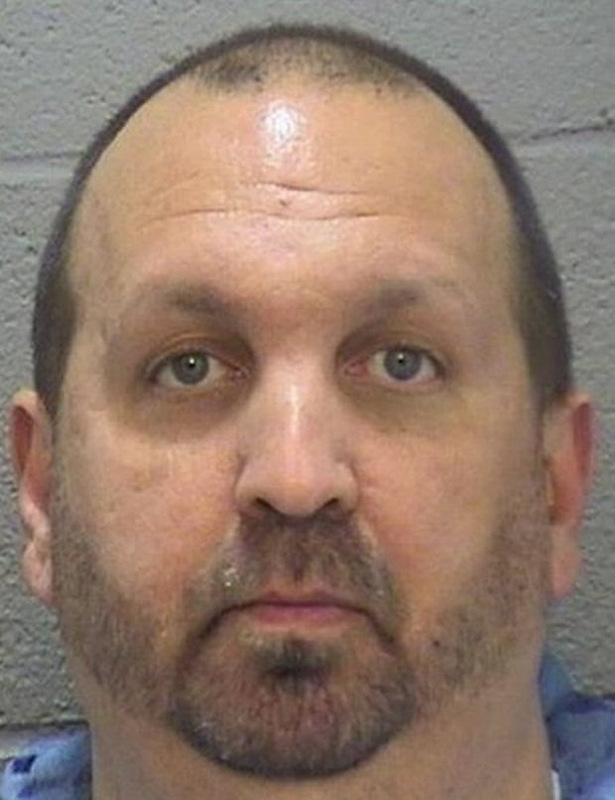 Exactly how much Hicks might have known about his young Chapel Hill victims is unclear. Did he know that Deah Barakat was a Syrian-American of Palestinian origin, who along with other UNC dentistry students was actively involved in arranging a humanitarian mission to Turkey, to treat Syrian refugees as part of a project organized by UNC-Chapel Hill School of Dentistry and the Syrian-American Medical Society? Did he know that Yusor and Razan Abu-Salha were terrific students, lovely generous happy talented young women, and Palestinian-Americans? Did he know how these young people spent their time, when they were together in the condominium with friends? Did Craig Hicks suspect they were up to something sinister -- mapping out a cunning parking plot, say? Or scheming up frightening new ways of providing free dental care to the indigent? There can be no question as to whether the killer understood that these people were devout Muslims; that much he would have had to immediately recognize, every time he appeared, armed and angry, at their door, which was decorated with a prayer in Arabic -- the sort of tense encounter which, according to witnesses, occurred every month or so. 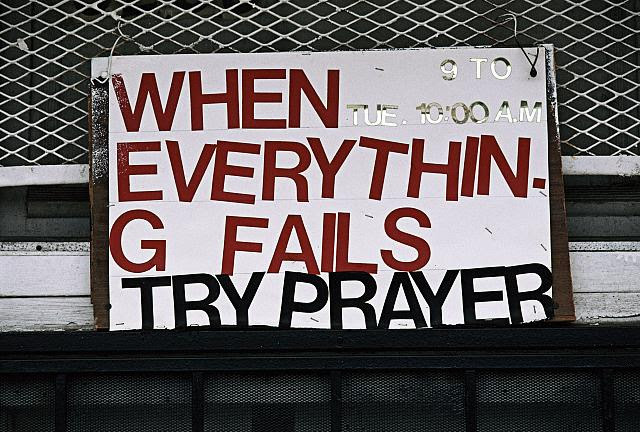 But it seems as though Craig Hicks wasn't one to care much about prayer, in any form. 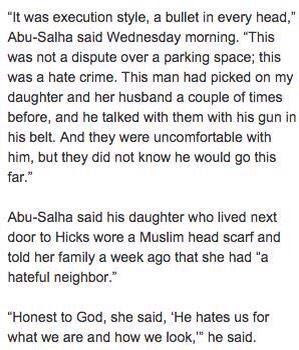 "Imad Ahmad, who lived in the condo where his friends were killed until Barakat and Yusor Abu-Salha were married in December, said Hicks complained about once a month that the two men were parking in a visitor's space as well as their assigned spot. "Both Hicks and his neighbors complained to the property managers, who apparently didn't intervene. 'They told us to call the police if the guy came and harassed us again,' Ahmad said." On the occasion of the murders, Hicks may have been surprised. There were some differences to be seen in the target environment. 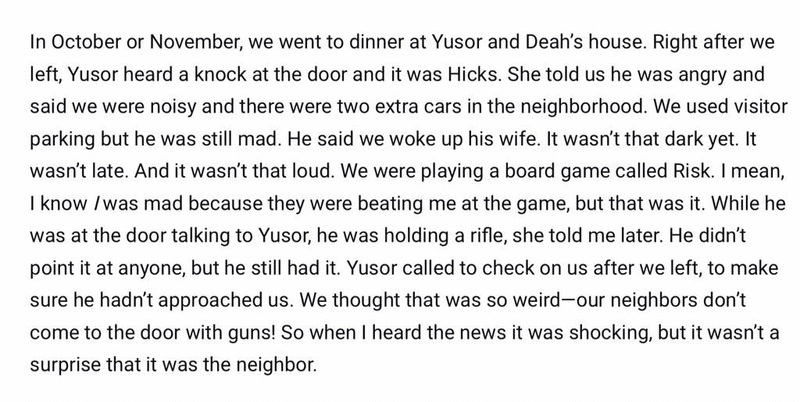 Deah Barakat and Yusor Abu-Salha were now married (they'd wed in late December, just six weeks before). Yusor's younger sister Hazan was visiting, evidently using one of the designated visitors' parking spaces outside the condominium. There is some question as to whether Hicks may have regarded these spaces as his own. "Police have not said how Hicks got inside the condominium, but on Wednesday afternoon there were no visible signs of damage to the door, which was affixed with orange stickers warning of biohazardous material inside. A wooden placard bearing Arabic script that translates to 'Thanks to God' hung over their doorbell." Had Craig Hicks perhaps also seen the film American Sniper -- another, more recent popular fantasy vehicle featuring American Terror (the export version) and vigilante-style Muslim-stalking spiked with execution-from-a-distance -- and empathized with its murderous hero's summary method of dealing with Muslims? This much is certain: if Craig Hicks made his bright young Muslim neighbours nervous, they had cause to be fearful; perhaps greater cause than they, even in their darkest private moments of secret distrust of the American Dream, could have guessed -- committed optimists though they seemingly all were, can they never have had a single such doubtful moment, looking as they looked, being what they were? 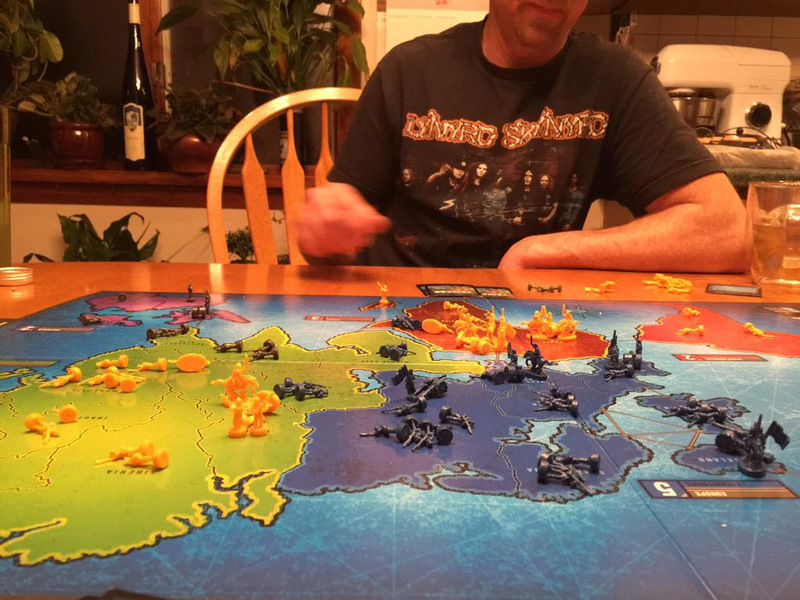 By looking the way they looked, and being what they were, and living so near to him, they were playing a mortal game of risk. 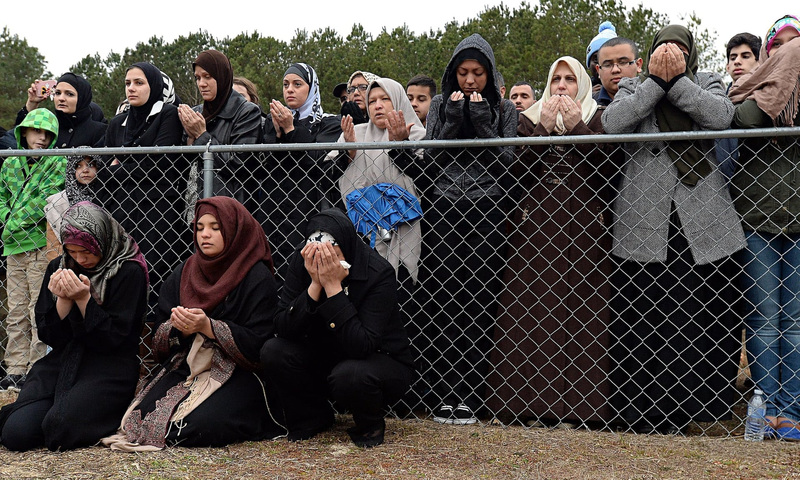 "Search warrants show the suspect in the shooting deaths of three Muslim college students in North Carolina had an arsenal of a dozen firearms in the home he shared with his wife, along with a large stash of ammunition. "Records filed in Durham County superior court on Friday list items recovered by police from the Chapel Hill condominium of Craig Stephen Hicks, the 46-year-old charged with three counts of first-degree murder. The warrants show that three handguns were recovered from the Hicks home, in addition to a pistol the suspect had with him when arrested. Also listed are two shotguns and seven rifles, including a military-style AR-15 carbine. Police also recovered numerous loaded magazines and cases of ammunition. Eight spent shell-casings were found in the neighboring apartment of the young couple killed." Rational people stayed out of this fellow's way, maybe quaked a bit inwardly when unfortunate enough to be in his presence, for when the bleak, chill winds of American Terror blow, the little leaves clatter meekly in the campus condo parking lots, as before an enchanter fleeing. 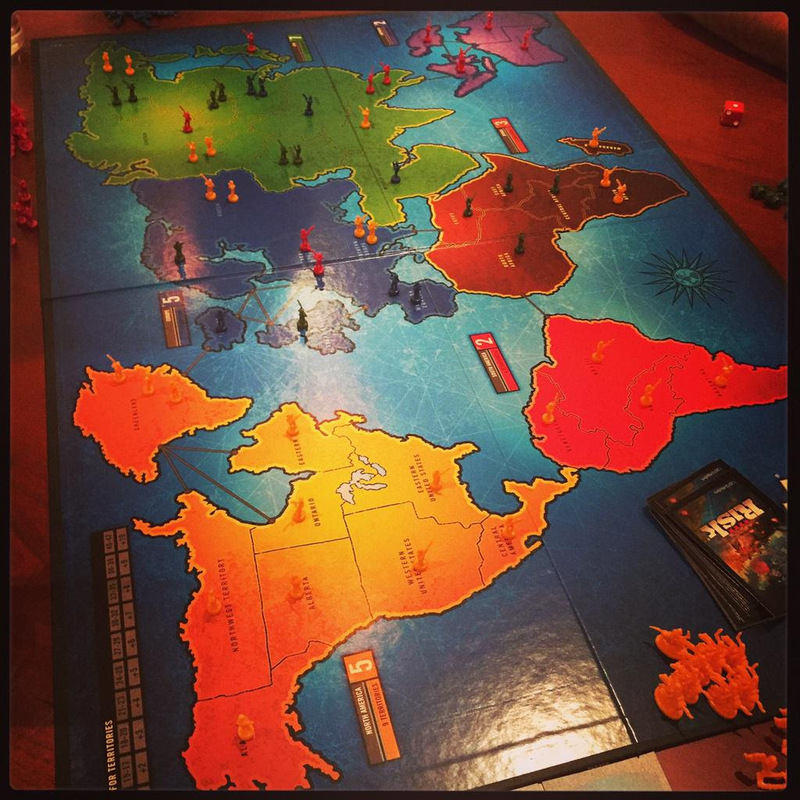 But the risk game's not quite over. Let us return across the rank, bitter field of ashes and aloes beneath which the soul of this country now lies buried, to consider again the grim, compulsive power of its media images: had the killer, like so many other frustrated and enraged white men with free-floating persecution complexes, counting over the hated names, fondling the beautiful weapons in the neatly kept gun lockers, been affected by, even, perhaps, derived some deranged sense of empowerment from the most recent wave of Islamophobia in America incited by publicity surrounding the atrocities of Islamic State? "Leaders from UNC, N.C. State, Duke and North Carolina Central University spoke at a news conference Wednesday evening on the UNC campus and stressed that it was too soon to know whether the students were victims of a hate crime. "It was logical for some people to hear about the shootings and wonder if recent news involving the Islamic State -- including the deaths of a Jordanian pilot and an American hostage –- could lead to some sort of reprisal against Muslims, said Mark Potok of the Southern Poverty Law Center.